Many people are spending more time in front of their computers now more than ever, the result is often case the familiar tired and fuzzy feelings you experience. This experience is referred to as Eye strain or technically, Computer Vision Syndrome. More than 60% of computer users globally experience this and the need to protect your eyes if you use computers all the time is very necessary. 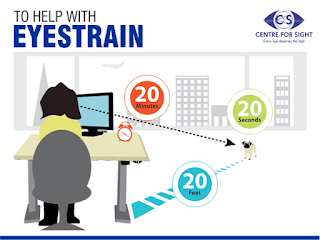 Continuous staring at a computer screen especially after 2 hours activates the eye strain symptoms, however, computer screens are not the only culprits, prolonged usage of smartphones, Television, tablets etc creates the same effect. For some of us, working on a computer screen is almost inevitable; fortunately, experts have suggested ways to minimize discomfort and the potential damage as a result of staring at the bright screen for a long time. Here are some easy tips to help protect your eyes. Dried out eyes can lead to permanent damage to the nerves of the eyes, that is why our eyes do sometimes blink involuntarily to keep it wet. 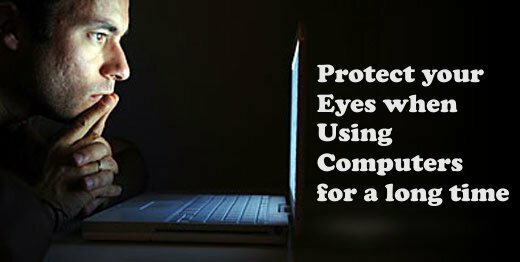 Help the eyes do its work and protect it by blinking more than usual when using the computer for a long time. You can also use eye drops to keep the eyes from getting too dried. When staring at small text, you may be force to squint and move closer to the screen. This continuous practice can cause headache and fatigue among other issues. Solution: Enlarge the text on your browser or word processing application to make reading easy. Locate the zoom tool with the familiar minus (-) and plus (+) glider and slide it to about 120% or above. 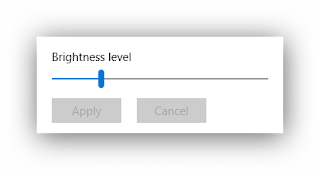 However, as much as possible, position your computer screen against a source of mild light in the background and let it be at an eye level. In addition to the last tips, this states that after spending 20 minutes staring at the screen (be it mobile or desktop computer screen), look away to some object of about 20 feet away for 20 seconds. This simple procedure helps your eye muscles to be adjusting and moving at intervals because staring at a fixed object for a prolonged time causes the muscles to ache once you move your focus away from the object. Protect your eyes even as you use your smartphone or computers everyday.